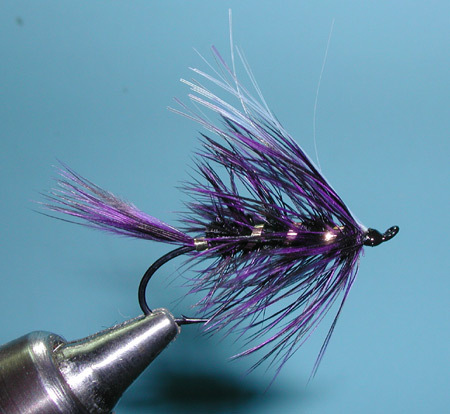 Notes: The Purple Peril Waker is a pattern that I took off from Scott Sadil's article in Jan/Feb 2015 issue of Calfornia Fly Fisher. Within that article, Scott describes a waker pattern used by his friend, Steve Wrye. Basically, any soft hackle or streamer can be made into a waker with the incorporation of fly foam to the shank. The purpose of a waker is to present itself at the surface film without breaking the surface. The floatation helps but you also need to use a floating line, a riffle hitch, and an across the stream swing presentation. The Riffle hitch is merely one or two half hitches of the tippet around the head of the fly pattern behind the eye of the hook after you have tied the tippet to the eye of the hook using an improved cinch knot or a turle knot. The misalignment of the tippet causes the pattern to have greater fluctuations of movement and will help pull the pattern closer to the surface. The hitch position to the pattern will create different actions when fished across the current. The most popular position is to tie the hitch so that the tippet is on the bank side of the pattern when the fly is directed upstream. Try to keep direct line tension to the fly and apply some pauses or jigging action. You can also use this pattern on stillwater applications utilizing pause and retrieve actions. The pattern is useful for both trout and smallmouth bass.